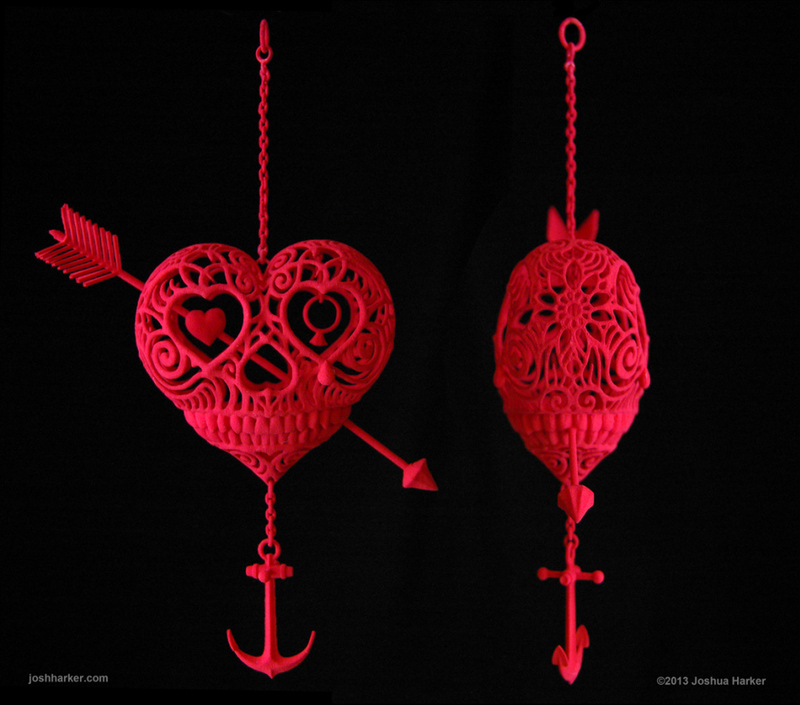 Today is Valentine’s day and I’ve decided to list a range of interesting designs / 3-dimensional works that I’ve discovered this week. 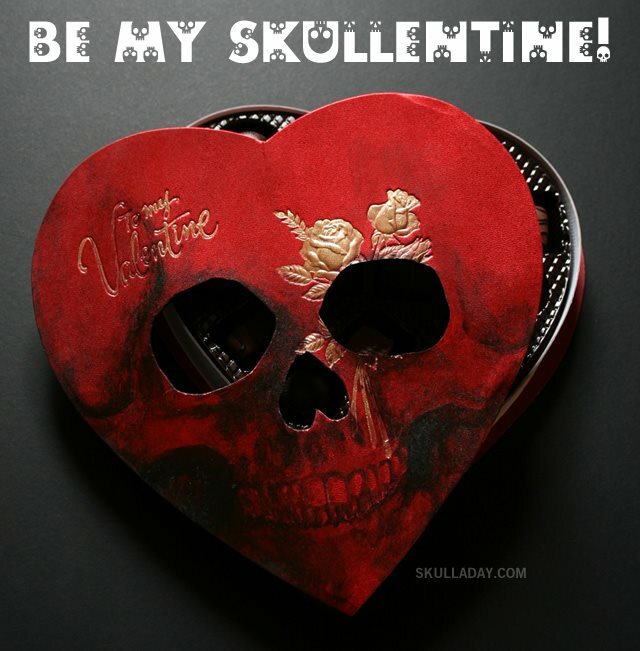 Who wouldn’t enjoy a skull shaped love heart or a box of delicious chocolate skulls? Well, I would definitely enjoy anything related to chocolate and skulls, this is the perfect combination! So here is a short list featuring my recent discoveries, enjoy! 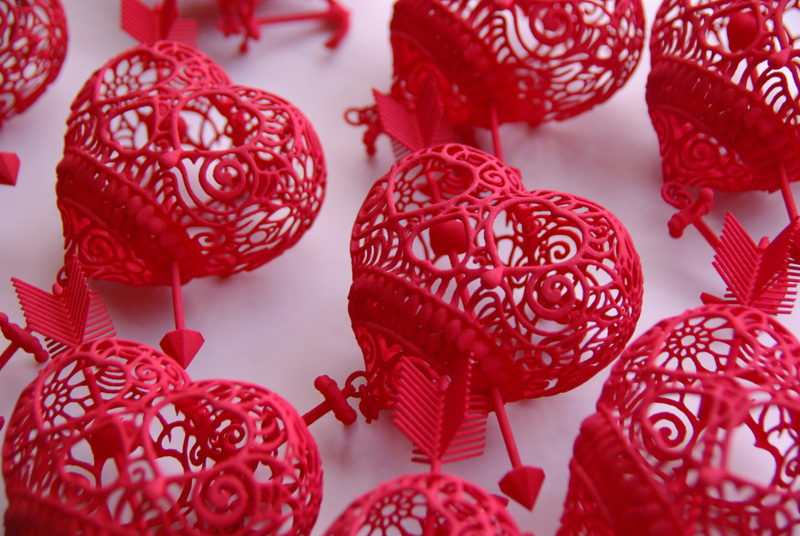 The post reveals three different designs or works that have depicted the skull within an artistic format for Valentine’s day or love in general. This particular work was created in 2008 for Skull-A-Day, which is quite a long time ago, although I do admire the artist’s dedication towards the project. It’s quite amazing to see Scalin’s work develop into an Internet sensation and the artist has created a book dedicated to this wonderful project that you can purchase online. Click on the link below for further details. 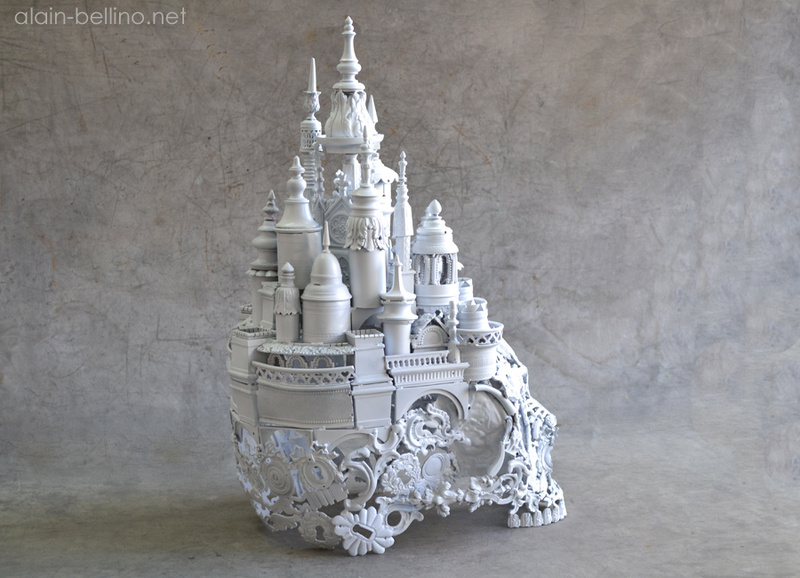 These 3-dimensional works are admirable and the overall meaning / significance is very captivating. 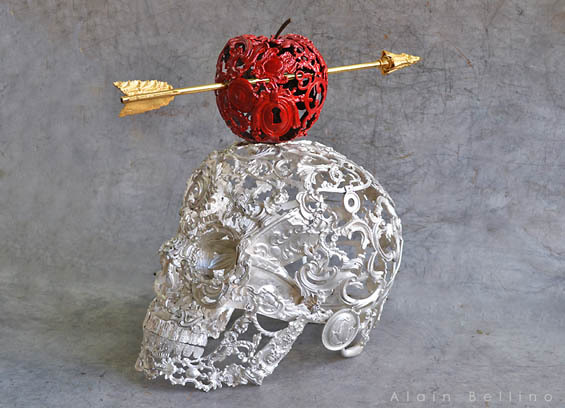 These intricate sculptures feature the characteristics of a skull within the shape of a love heart that are juxtaposed with an arrow, an anchor and a ring. 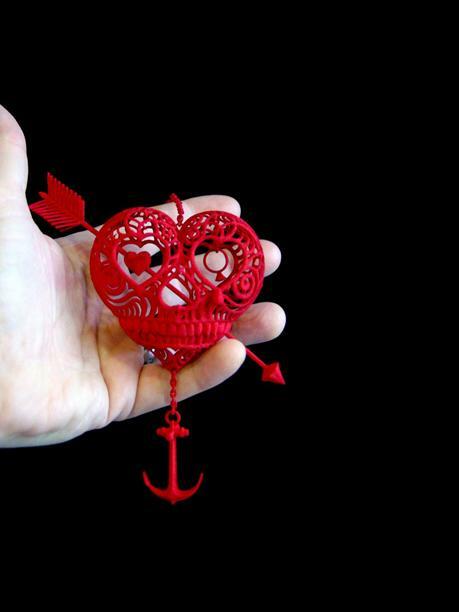 Harker uses 3D printing in order to construct his detailed, yet imaginative works that are transformed into a three-dimensional object and the process is explained in further detail through the artist’s webpage.4 Harker’s work is inspiring and the intricate patterns / designs provide an artistic perspective in regards to love, death and mortality. You can purchase these wonderful works through Harker’s online store and I must admit, these sculptures would make a beautiful gift for Valentine’s day! In some of my previous posts, I have discussed the works of Joshua Harker, click here to view Part I and Part II. While Harker’s design is fastidious and technical compared to Scalin’s work, I do admire the overall production behind the 365 Skull-A-Day project including the skulls, the blog and the social media sites; it was rather difficult to decide which one to discuss fist, as Harker and Scalin produce some marvellous work! 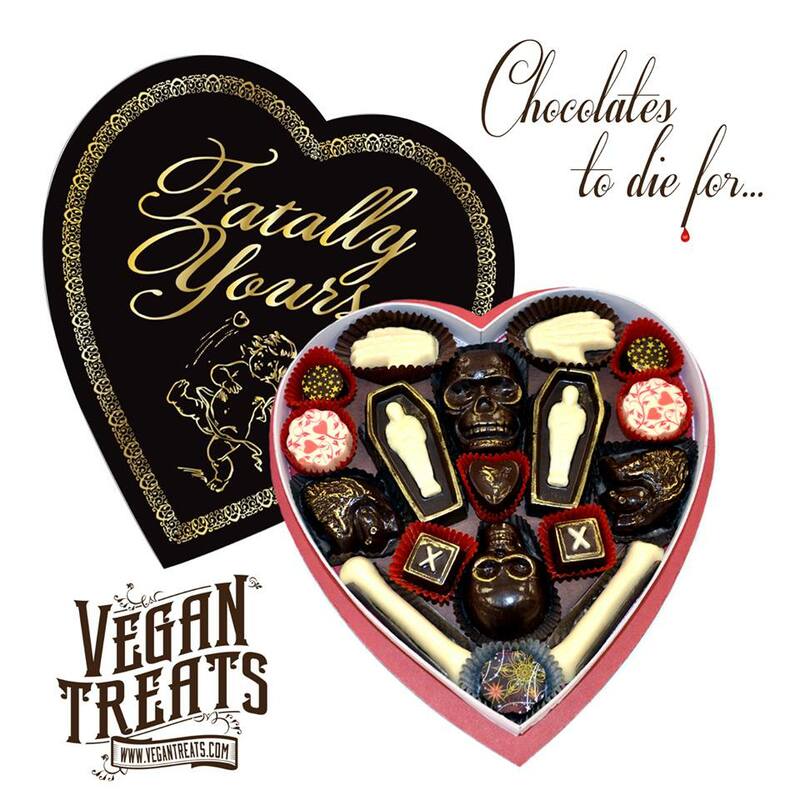 While I was searching through the Internet, I discovered a very interesting company known as, Vegan Treats who have produced a range of intricate chocolates featuring the shape of a skull that also includes a pair of hands, torsos, skeletal bones and coffins. This isn’t your ordinary box of chocolates! Personally, I haven’t tried any Vegan desserts, although I’m constantly advised by friends and families that they taste delicious. I do prefer consuming chocolate that’s made from milk or other animal byproducts, although I’m willing to try these Vegan Chocolates, as I would love to see these intricate, eligible skulls in person plus I would love to try these chocolates in order to develop my own opinion. In regards to the product design for the chocolate box, I personally believe that the gold clashes with the black, although the chocolates feature a very creative, yet fascinating style that does make me feel hungry from time to time and that’s the most important part! 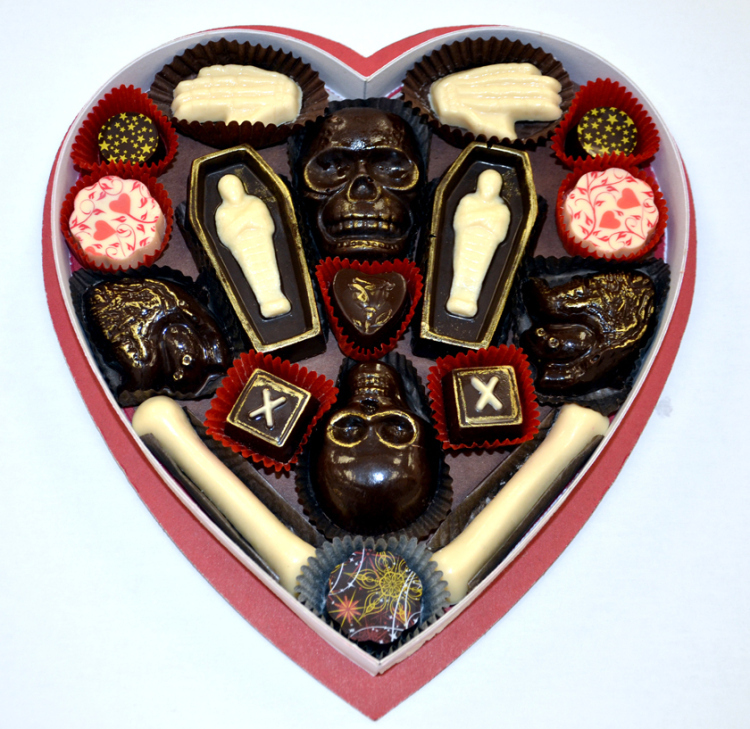 ‘Fatally Yours’ would make the perfect gift for any occasion including Valentine’s day, what isn’t there to love about skulls and chocolate, the thought is just too overwhelming for me. Skullspiration have published a fantastic article in relation to Konya’s vegan treats that’s definitely worth viewing as well. So here are my top recommendations and I hope you all enjoy the rest of your Valentine’s day, I shall return very shortly with another skull related post, bye for now! 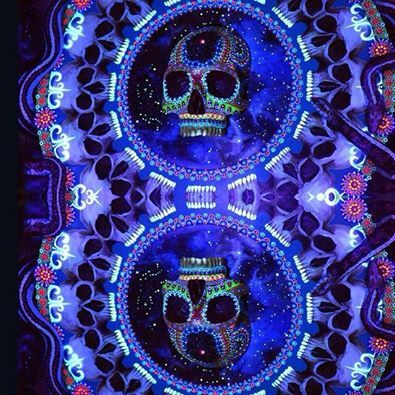 Last week, I discovered this amazing video clip featuring a range of creative and artistic designs that were projected onto a large, three-dimensional skull. 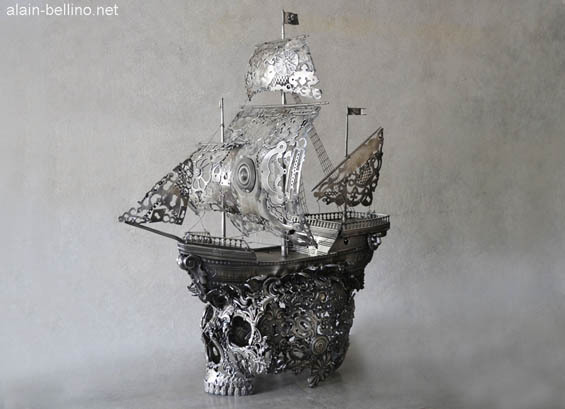 Artist, Joshua Harker and Bartkresa Design have developed a project known as, Shogyo Mujo that creates a very creative, yet dynamic experience within a three / four-dimensional format.1 If only I was able to view the skull in person, now that would be one fantastic experience worth travelling to! I was completely fascinated with this colourful, three-dimensional skull and I decided to explore the project’s overall development, the design and the concept behind Shogyo Mujo. In reference to the Shogyo Mujo website, this remarkable sculpture “represents the 1st of the 3rd marks of Dharma which suggests that all things are impermanent.”2 At first, the sculpture was produced for the Burning Man Festival in Nevada and the overall structure including the materials were designed to burn towards the end of the festival, as referenced by Dan Cowles article via the Adobe website. Cowles explains that the choice of the materials as well as the unfortunate weather conditions increased the level of difficulty or complexity in regards to the overall installation. In fairness, the three-dimensional skull including the projections were very impressive despite all of the previous challenges or set backs. There is a very compelling video clip on the Adobe website that does explain the overall production of Shogyo Mujo and it is amazing to see a very large production team collaborate together in order to establish a very large-scale installation. Cowles suggests that the sculpture was designed to burn or disintegrate for the Burning Man Festival, although I’m struggling to search for a video clip or some photographs which displays the skull burning into flames. The burning skull relates to the notion of impermanence; a clearly visibly structure is deconstructed or dismantled into something irreparable. In fact, the project has invited me to explore the idea that life is impermanent and everyone will eventually die, our bodies will decay, the skin on our bones will eventually disintegrate until there is nothing left except for our skeletal remains. I know this sounds pretty morbid right now, although the sculpture allows me to consider my impermanent existence within the world. Cowles briefly mentions that the ‘Shogyo Mujo’ was displayed at the Adobe Max in Los Angeles with a full “360 degree projection” and the sculpture received a very positive reaction from the audience. I would highly recommend watching the video clip, the different patterns and designs are sensational, they definitely work well within a public setting.There is a drastic improvement in terms of the execution and the ‘360 degree projection’ does add a sense of depth to the overall sculpture. I do admire the team’s effort to expand or push the project in order to reach its full potential. 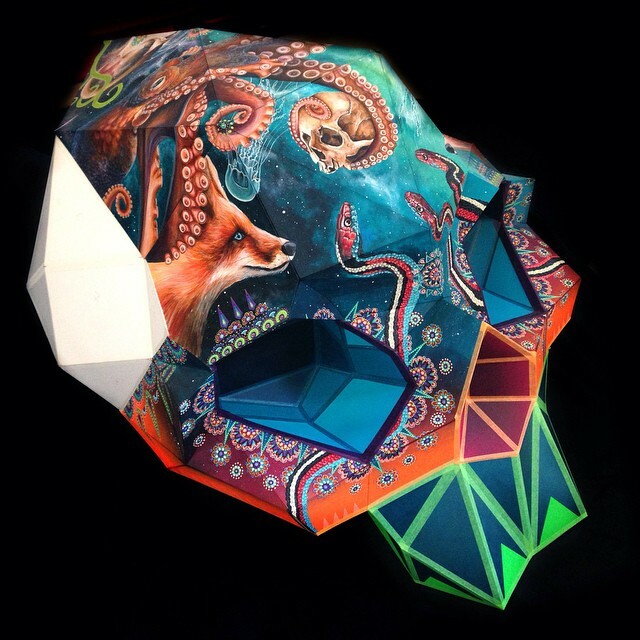 The project provides a unique perspective in regards to the image of the skull through a 12-foot, three dimensional structure along with a series of artistic, yet eclectic projections. I do prefer the concept behind the Burning Man Festival, where the skull would be burnt or destroyed through fire, although the execution at the Adobe Max was suburb! The project also provides a different perspective that challenges the viewer’s interpretation of the overall work. According to Joshua Harker’s website, “the project is an exploration into creating art in 4-dimensions: 1D point in space where the event occurs (lat & long), 2D projection patterns, 3D sculpture, 4D animated projections & the event as they occur in realtime.”4 This is the most exciting aspect of the project, the viewer is exposed to an elaborate project within a four-dimensional context; while Shogyo Mujo features a technical process, the artistic elements within the work are admirable! 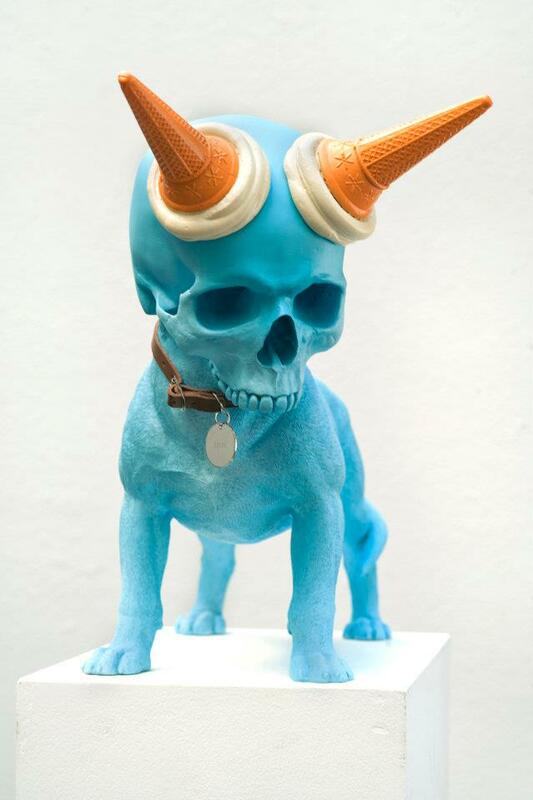 Joshua Harker does create a range of sculptural works featuring the shape of the skull through the use of digital software including a 3D printer in order to produce a ‘tangible’ structure, as referenced by the artist’s website.5 If you have an interest for skulls, I would recommend visiting Harker’s online portfolio the collection of work is impressive! In a way, Shogyo Mujo does extend upon this particular concept at very large scale; in the Adobe video clip, Dylan Roscover explains that the digital form becomes a ‘tangible object’ that is introduced to an “analogue space.”6 The project successfully combines the use of technology and art in order to create a large, 3D skull that features a very distinctive approach towards the overall display or presentation of the installation. Make sure to check out the Shogyo Mujo Facebook page for further details! Images are sourced from the Bartkresa Design Website and the Shogyo Mujo Linked in page. 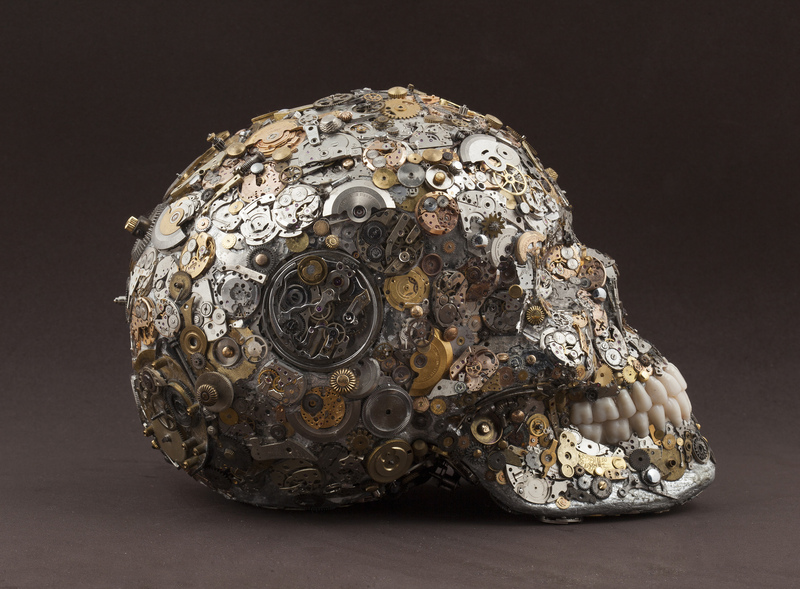 About a couple of months ago, I discovered a unique collection of work by an artist / sculptor named Rubèn Pàmies aka Kpavio who has created a range of remarkable, three-dimensional skulls that explore the notion of ‘life and time’ through individual watch pieces as well as other distinctive materials. I have conducted an interview with Kpavio in order to discover the processes, methods and techniques that are used to create these fascinating, yet mesmerising skulls! Black Calavera: Where did the name Kpavio originate from? Kpavio: It means ‘skull’ in Greek and I use it as my artistic pseudonym. Black Calavera: How long have you been working on Kpavio? Kpavio: I have been working on Kpavio for the last four years. life and the passage of time? Kpavio: Well, I have always been interested in the passage of time, maybe that is the reason why I dedicated more than 25 years to the world of watchmaking and now I am exploring that relationship through my sculptures. 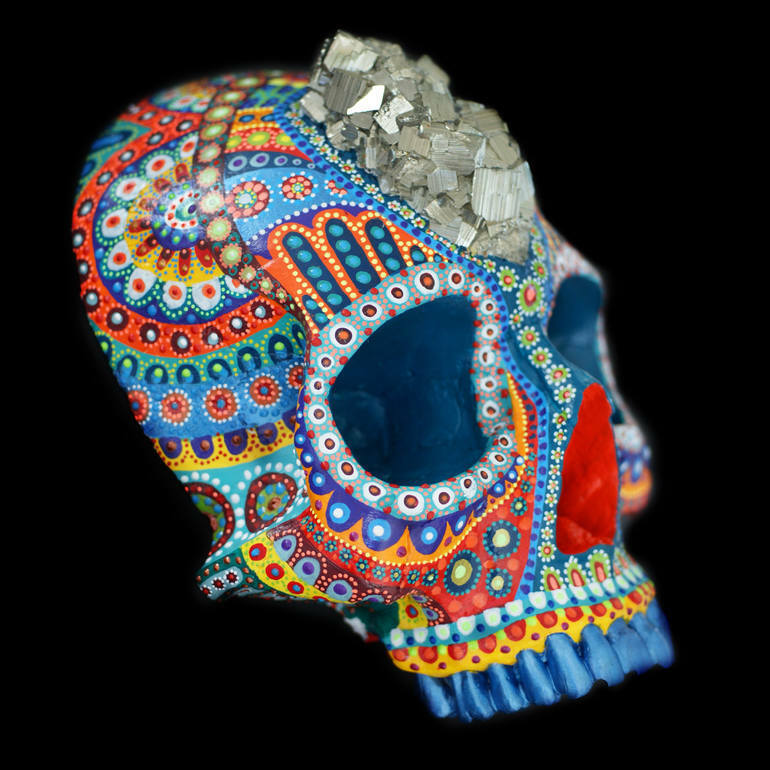 Black Calavera: I have noticed that the skull is frequently used within your sculptural projects, is there anything that has inspired you to use the skull as a visual art form? 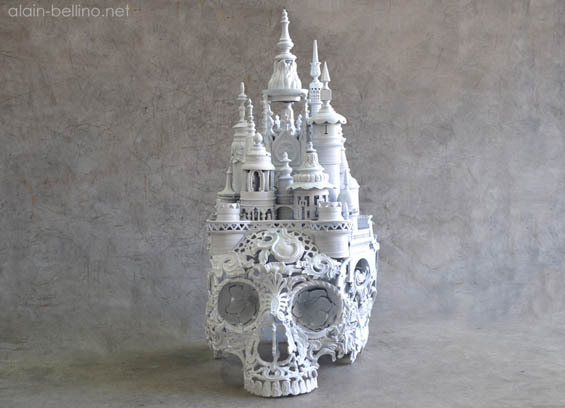 Kpavio: To date, all of my sculptures have a skull as the base because I have always been attracted to the world of skulls and I think they are a good way to explore the connection between life and the passage of time. 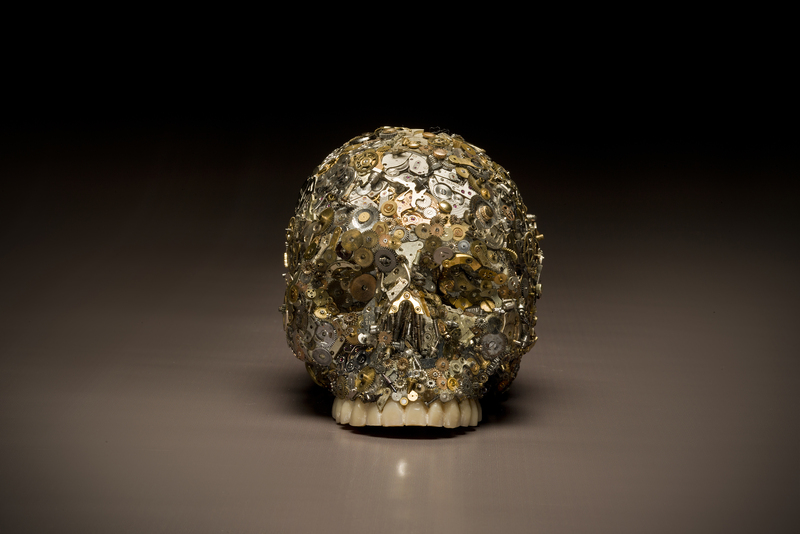 Black Calavera: How do you use the skull in your work? Kpavio: I acquire them and then I personalise them, sometimes with paint, sometimes with a denture, until now I always use some pieces of watchmaking. Black Calavera: Where do you acquire the skulls from? are they real? 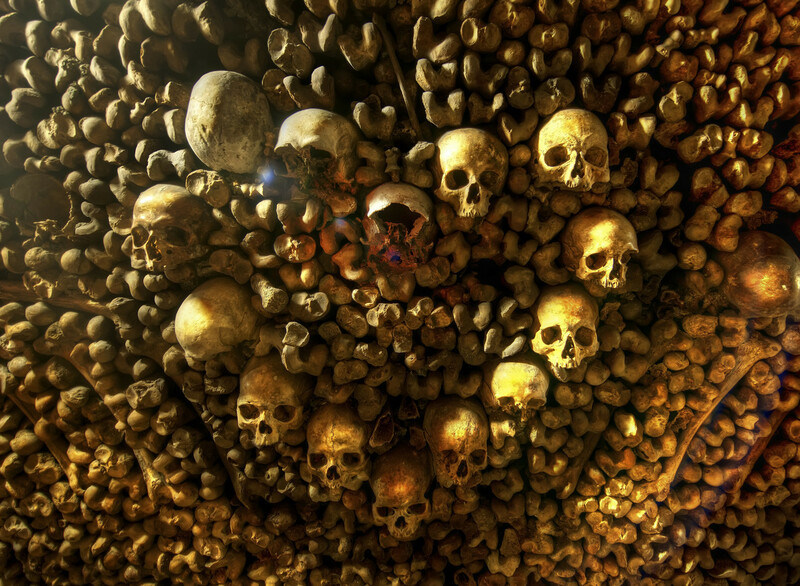 Kpavio: The skulls are replicas, some of them are old and in most cases, made of plaster cast. I buy them and then I use them as the base of my creations, some of them are old replicas while others are modern. 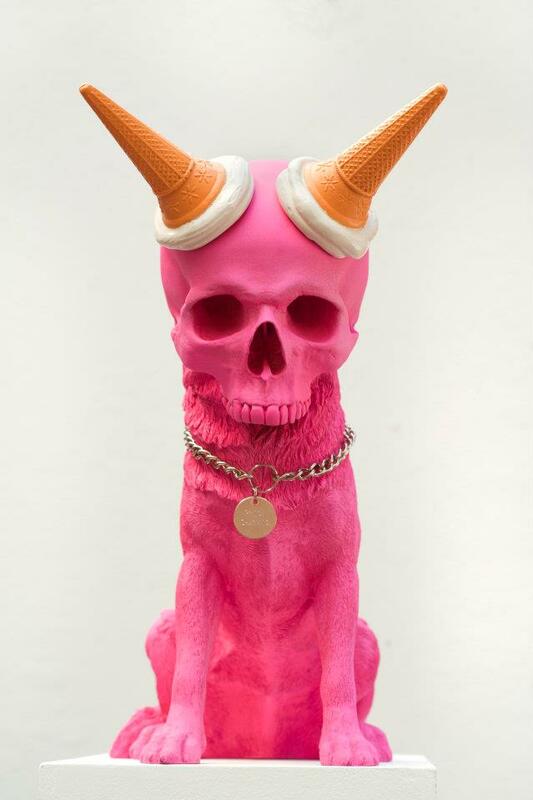 Black Calavera: How long does it take for you to create one of these sculptures? Kpavio: It depends on the piece, when I acquire the skull there is a process of study in which I explore the possibilities of the piece and decide its theme. After that, I start the process of creation that depends on the complexity of the final result I want to achieve. Black Calavera: Is there a project that you have enjoyed the most? Kpavio: No, all of them have been very enriching. Black Calavera: Has your practice or style changed over time? Kpavio: Well, I am always exploring new themes and materials to work with. Black Calavera: How has your interest in fine watchmaking influenced your work? Kpavio: It plays a great role in my work, as I always use watchmaking pieces in my sculptures. Black Calavera: Is there a specific type of watch that you prefer to use within your work? Kpavio: No, I use all kind of pieces although the movements are very useful for me. Black Calavera: Is there any significance behind the pieces that you use from the watch? Kpavio: It depends, sometimes I want to use a particular piece, like a movement within a specific part of the skull because I want to express a concrete idea. In other occasions I use a little piece because it fits perfectly within the part of the skull that I am working with. Black Calavera: Besides watches, are there any other materials that you enjoy working with? Kpavio: I am always open to exploring different materials in my artworks. 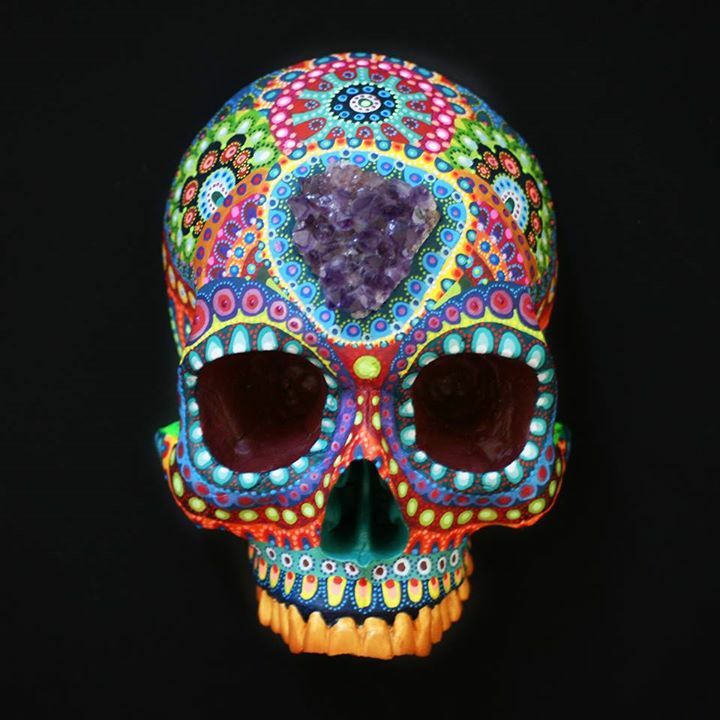 Black Calavera: Are there any artists / sculptors that have inspired your work? Kpavio: I like many artists and distinct currents, I have been interested in the work of Banksy, whom I admire his creative and provocative ability, especially the fact that he wishes to remain anonymous. 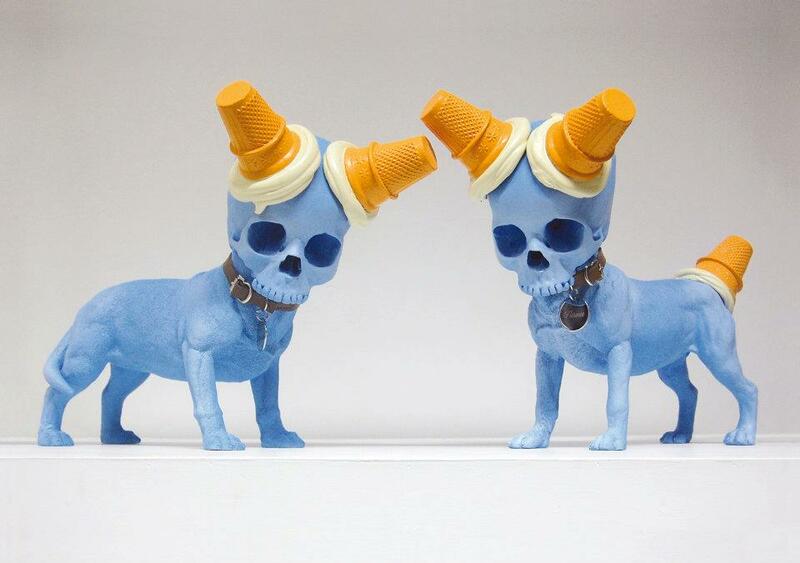 Black Calavera: Do you have any future plans for upcoming projects / exhibitions? Kpavio: I have a lot of future projects, but time will tell if they could become a reality. Black Calavera: Do you have any advise for practicing or emerging artists? Check out Kpavio’s website or Facebook if you would like to learn more about the works! Yesterday I decided to search through all of my photographs that I have taken over the past year and it’s surprising what you will actually find! I found one photo in particular that immediately captured my attention and I began to wonder why I left this image on my SD card for so long. In February 2014, I remember visiting the Melbourne Now exhibition at the National Gallery of Victoria that explored Melbourne’s artistic and cultural diversity. According to the official NGV website, the Melbourne Now exhibition featured a range of contemporary works including visual arts, sculpture, graphic design, architecture and performance art. I was fascinated with one installation in particular entitled ‘Vox: Tasmania’ by Brook Andrew, a contemporary artist born in Sydney whose work depicts certain issues relating to culture, identity and colonialism, as referenced by the NGV website. On Brook Andrew’s WordPress Site, the artist specifically mentions his ‘Australian indigenous / Scottish’ heritage that may feature a connection towards the artist’s work. According to Andrew’s WordPress Page, ‘Vox Tasmania’ features a range of books, photographs, images and artefacts that reflect the treatment of the indigenous community in Australia during the 19th century. The installation also features a large, intricate gramophone that is placed next to the wunderkammer; according to Andrew, the gramophone amplifies the way these indigenous remains were perceived or valued back in the 1990’s. As I peered through the gramophone, I recognised a human skull enclosed within a glass container and the installation does provide a very interesting perspective. From a personal perspective, the gramophone does create distance between the viewer and the skull; it was as if I was viewing the installation from the other side of the gallery space. Once I continued to walk around the installation, I suddenly realised how close I was standing to the wunderkammer. The work itself creates an illusion, to me the installation did create quite a surreal experience. As I began to walk around the installation, I immediately discovered an entire human skeleton carefully and delicately rearranged within the container. This is definitely my favourite section and I couldn’t take my eyes off the skeleton, I don’t think I’ve ever been this close to a real human skull before, well I haven’t actually seen one in the flesh before. 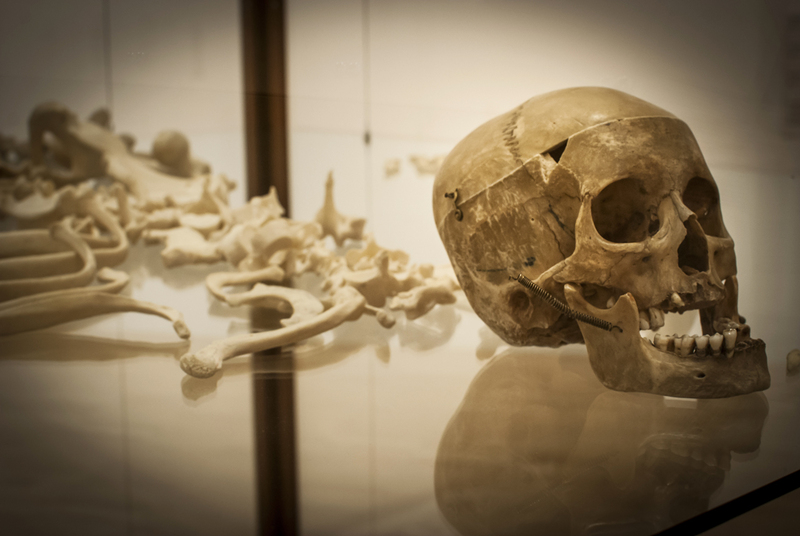 The human skull reflects a moment in time, a moment in history that is almost impossible to forget. The installation has invited me to question whom the remains to belong to and the actual cause of death, the mistreatment towards the indigenous population stares the viewer right in the face! The installation was confronting and the skull initiates ideas relating to death or mortality and I began to wonder what happens to our remains once we die? Would our bones last forever or would they eventually disintegrate? The work itself does provide quite a confronting experience, although I was intrigued by the overall subject matter. While I couldn’t take my eyes off the skeleton I was also quite disturbed by these historical moments and the way these remains were treated. 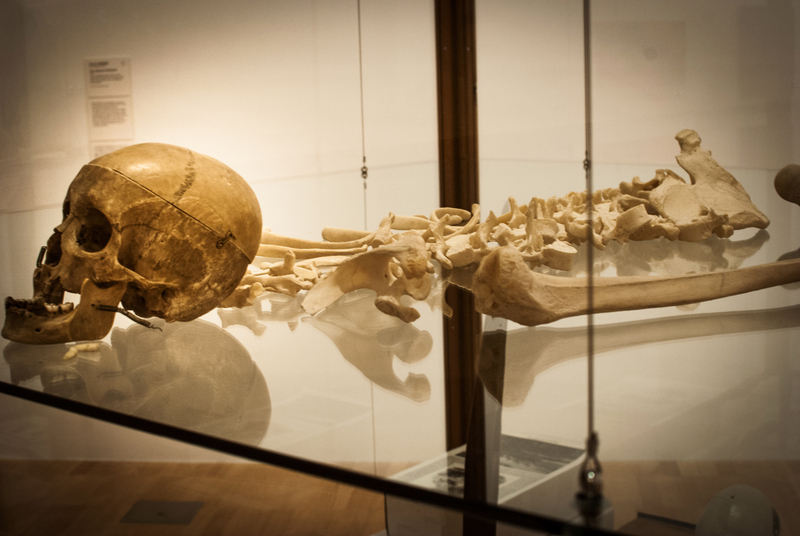 The installation also features a range of books, images and photographs that also coincides with the human skeleton. It’s interesting to see how these different elements connect to each other in some way. As I continued to walk around the wunderkammer, I began to recognise the minor details that I failed to recognise at the very beginning, it was as if I was searching for the missing pieces for a jigsaw puzzle. Overall the Melbourne Now exhibition at the NGV was definitely worth the visit and the works on display were displayed in a unique, creative manner. Andrew’s ‘Vox Tasmania’ explores an intriguing yet confronting subject through a range of images, photos and historical artefacts including a real human skeleton! The way the works were displayed was fascinating; although I was shocked to discover the way these remains were used for research or private collections. If you haven’t see Andrew’s work before I would definitely recommend visiting the artist’s WordPress page or the NGV website. Melbourne Now: 22 Nov – 23 March 2014, Wall Text – Brook Andrew: Vox Tasmania, National Gallery of Victoria, Melbourne.